1,600 square feet of indoor event space, 5,000 square feet of garden space, ceiling fans and dimmer switches, an abundance of windows, beautiful outdoor balcony, large elegant restrooms, bride's room, fountain and benches, parking, service kitchen, dramatic entry, maximum guest capacity 250. The Community Center is an historic building with a rich history. 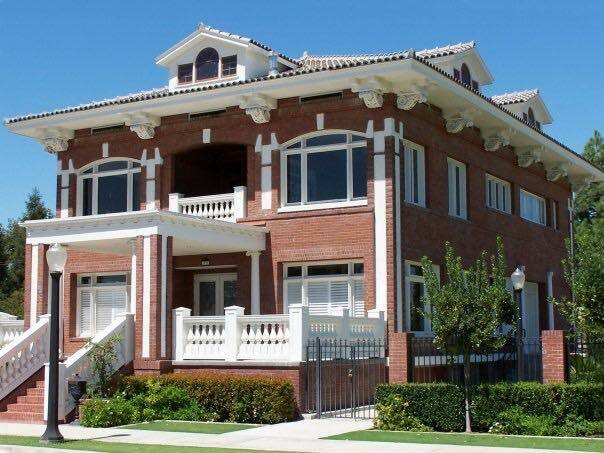 It was originally designed in the Italian Renaissance style by Bakersfield architect Orville Clark as a funeral home with integrated living quarters. It was built in 1911 for the Payne family business at an initial cost of $30,000. The building is constructed entirely of brick with tapered column piers on each side of the entrance and was designed to resemble an elegant residence with matching parlors, a distinctive tiled lobby and extensive mahogany interior woodwork and trim. A 1948 renovation added additional flooring space and updated interiors.